I’ve slowly been acquiring Thin Lizzy albums and this one was near the top of my list because I kept reading that it was their heaviest and had an “80s sound” to it. I don’t think any of the critics meant “80s sound” as a compliment, but terms like that attract me to albums, not repel me. And just take a look at that cover! That’s metal, baby! 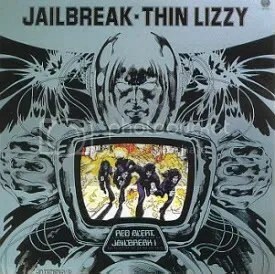 At this point, I’m not expert of Thin Lizzy, but from everything I’ve heard from them, this is by and far my favorite release. What a note to go out on! From beginning to end, this album does not let up. It still sounds like Thin Lizzy but from the opening track, you KNOW the band is packing a lot of punch and aggression on this release along with that “80s sound” and some great guitar playing, no doubt helped along by the band’s new guitarist John Sykes (Whitesnake, Blue Murder). This release isn’t really pointed at as essential Thin Lizzy, but I don’t see why not. Listen to “The Holy War”, “Cold Sweat” and “Bad Habits” and tell me they don’t deserve to be ranked against any other Thin Lizzy song! Highlights: I honestly cannot pick just a handful of songs. This may now be one of my favorite albums EVER. Infectious and hard rocking nonstop. 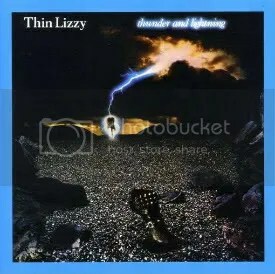 I just recently gave Thin Lizzy a chance. I had been hearing for years about how great they were and how underrated they were in the States and how they should’ve been a huge commercial success over here, so I decided to pick up a few albums and hear for myself. I was already familiar with “Jailbreak” and “The Boys Are Back in Town”, but the rest is new to me and it’s great stuff. Phil Lynott has often been called a poet, and that’s true, I love the lyrics to these songs and as for the sound itself? It’s a great blend of hard rock and pop, they rock hard but not so hard that their sound would turn off the mainstream, so it really is a surprise this album didn’t go platinum a few times over. An outstanding and classic release. You can really hear how the band’s famous twin guitar attack influenced the New Wave of British Heavy Metal movement with a song like “Emerald”. I love the album cover, it looks like art you’d see in a 1970s Marvel Comic. The artist is Jim Fitzpatrick.